Spam musubi is appreciated for its taste and portability. A single musubi, usually wrapped in cellophane, can be purchased at small deli-type convenience stores (including 7-Eleven stores) all over the Hawaiian islands, ranging in price from $1 to $2. The 7-Eleven stores include a wide variety of flavors, including a regular Spam musubi and a deluxe Spam musubi (with furikake and a scrambled egg). 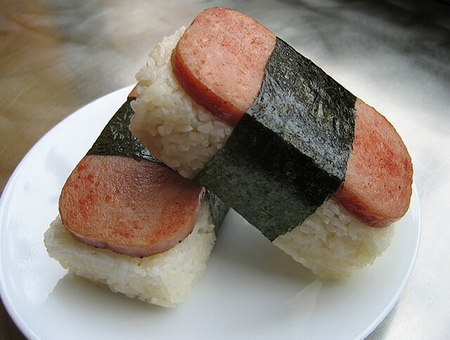 Other variations include a musubi made with fried shrimp, chicken katsu, or pork cutlet instead of Spam. Spam musubi acrylic rice molds are available at many kitchen stores in Hawaii. These molds are a few inches deep with a width and breadth that matches a slice of Spam. By the way, United States President Barack Obama, who was born and raised in Hawaii, is a noted fan of spam musubi. Recipes vary but typically slices of spam first are grilled, sometimes with a light teriyaki flavor. An acrylic mold is then placed over a sheet of nori and rice is pressed into the mold. The grilled spam is placed over the rice in the mold and the mold is removed. The nori is then wrapped over the top and around the musubi.